Wouldn’t it be a great feeling to get Quotes accepted from your customers without posting, emailing, hassling, or chasing them? Well worry no longer. 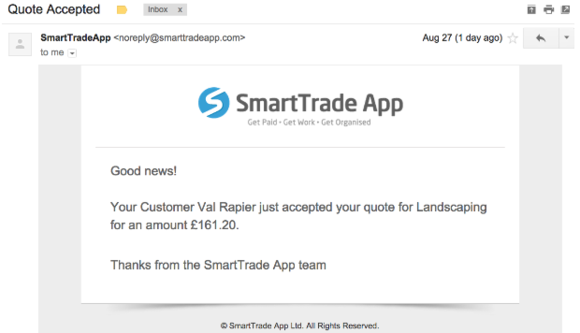 When you send a Quote out from the SmartTrade App or SmartTrade Web Dashboard the customer gets a Quote email. In that Quote email is a beautifully laid on out PDF attached to the email with all the Quote details, and once they click ‘Accept Quote’ your customer cannot complain they didn’t agree the quote! SmartTrade App sends you a message on your mobile and an email to your inbox with the good news of ‘Quote Accepted’. The Quote turns to a Job automatically and then you can get paid easily with SmartTrade! This feature means more work or sales with less spent making and chasing Quotes. Watch a tutorial video about sending Quotes from the App or Web Dashboard. Try it today.